"Déjà vu all over again," as Yogi Berra would say about this Crowell preening pintail, which broke the $205,000 record in 1986 when Russ Aitken bought it for $319,000, a record that would last for 11 years, and broke the $684,500 record when it was sold out of the Christie’s auction in cooperation with Guyette & Schmidt of the Aitken collection on January 18,2003 for $801,500. Russ Aitken shook up the decoy world four times, twice in the mid-1980s and twice after his death last year. First he bought the circa 1860-70 pair of red-breasted mergansers by Lothrop Holmes of Kingston, Massachusetts for $93,500 at Christie’s October 1985 general auction, not quite a record as a pair has to double the cost of a single lot plus one dollar to set a record, and the record at that time was $50,000 for a Bowman golden plover. Then he bought the circa 1915 preening pintail by A. Elmer Crowell of East Harwich on Cape Cod, Massachusetts for $319,000 at Oliver’s July 1986 auction, breaking the record of $205,000 held by the Lincoln wood duck and holding the record for the next 11 years. When Russ Aitken died last year, his wildfowl decoy collection was consigned to Christie’s, who held the auction in association with decoy experts Guyette & Schmidt on January 18, 2003 at Christie’s New York City galleries. Announcement of the auction split the decoy community over which would bring more money, the Crowell pintail in remarkably fine condition and the only one known, or the Holmes mergansers with minor problems, such as a restored bill on the hen and wear down to bare wood in spots; one of two pair known. This question was revealed by the identical estimate of $300,000/500,000 given each and their positions on the auction catalogue cover. The Holmes pair was featured on the front cover uncut, while the Crowell pintail was relegated to the back cover and cropped into a 3-1/2 by 2-1/4 inch rectangle. The pintail was first up and sold for $801,500, setting a new record price for any wildfowl decoy or decorative at auction, to Boston dealer Steve O’Brien Jr., who was assumed to be buying it for the gentleman seated next to him. Later in the auction, the Holmes pair made $394,500, half the price of the new record holder. 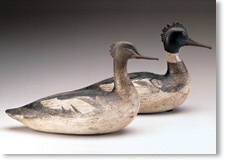 Russ Aitken shook up the decoy world when he bought this pair of red-breasted mergansers by Lothrop Holmes of Kingston, Massachusetts at Christies October 1985 auction for $93,500, at the time the highest price for a decoy lot at auction. When sold at this auction out of the Aitken collection, the pair brought $394,500. One more word about the Crowell preening pintail: When it was sold in 1986, some denigrated it as a decorative and others said it was a decoy that was put on the shelf. We always thought of it as a decorative because of its varnished underside, typical of Crowell’s decoratives (his decoys were painted on their bottoms). Collectors who have come to realize that decoratives were made with more care and better paint now consider decoys and decoratives as equal in value. There were six Crowells among the top 25. In addition to the first place preening pintail, there were two that tied for fourth place at $59,750, both well over estimate: a near-mint decorative flying mallard wall plaque with minor problems (chipped lower wingtip and thin crack on upper wingtip) and a very rare ruddy turnstone decoy with replaced bill, tail chip and some light chipping to the back. 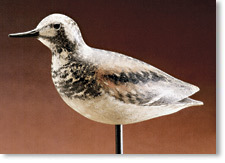 A decorative black-bellied plover on a carved clamshell had some of the usual reinforcement of the legs and sold over estimate at $26,290, taking 15th place. A willet decoy with minor flaking made estimate at $15,535, tying for 23rd place. And a preening yellowlegs with the top of the raised wing broken and reglued tied for 25th place at $14,340. Two five figure Crowells that just missed the top 25 were a decorative killdeer on a carved base and with minor wear at $13,245, and a black-bellied plover with minor flaking on its back at $10,158. 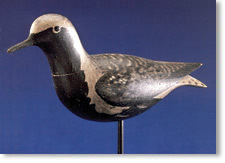 The top price for a duck decoy was a beat-up mallard, over estimate at $9540, and his best miniature of a little more than a dozen offered was a mint Hudsonian curlew at $4780. Altogether, there were two dozen lots of Crowells in the Aitken collection. The number of Lothrop Holmes birds in original paint is so low that it was quite an achievement of Russ Aitken to acquire the merganser pair and the plover and the yellowlegs. The black-bellied plover had only one minor flaw, a hairline separation at the “neckline” (if birds can be said to have a neck) and it sold well over estimate at $77,675, the auction’s third highest price. The feeding greater yellowlegs had a replaced bill but that didn’t keep it from selling at $28,680, almost double high estimate. The three lots by Gus Wilson of South Portland, Maine ranked sixth, seventh and eighth among the top 25: 6th was a pair of red-breasted mergansers that sold within estimate at $57,360, 7th was a single red-breasted merganser that sold well over estimate at $47,800, and 8th was a surf scoter with a carved mussel in its bill that sold over estimate at $38,240. Condition was rugged, as is to be expected of Wilson’s birds, but nothing serious. There were some who were put off by the hairline separation where the head meets the body of this late 19th century black-bellied plover by Lothrop Holmes but enough were swept up by its beauty to drive its price over estimate to $77,675. Three of Shang Wheeler’s decoratives made the top 25 list. His sleeping black duck may have been made for hunting but it was never rigged; in mint condition, it sold over estimate at $35,850, putting it in a four-way tie for 9th place. His decorative snow goose that came out of the Connecticut Audubon Society collection made $23,900 (16th place). And his decorative ruddy duck at $16,730 was in a three-way tie for 20th place. Russ Aitken had nine of Shang’s scenic pairs of shorebirds that were in the Connecticut Audubon Society collection. The buyer of the collection, so the story goes, was trying to unload them, and Bud Ward served as the intermediary and sold them to Aitken. The first pair offered (curlews) made $6573 and from there it was all downhill, to $2868 apiece for the pairs of ruddy turnstones and sandpipers, sad to say, all under estimate. Of the more than two dozen lots made by the Ward brothers of Crisfield, Maryland that we find in the Aitken collection, three pairs made the top 25 list, all three over estimate, and all three decoratives: standing green-winged teal at $17,925, gadwalls at $16,730 and ringnecks (1964) at $14,340. There were also five five-figure lots that just missed the top 25: a 1960 preening black duck decorative at $11,950, a preening pintail decorative at $11,353, and three lots at $10,755 each: 1967 decorative brant and snow goose, and a 1936 dated working canvasback hen. Crowells early 20th century ruddy turnstone had a tail chip, replaced bill, and some chipping of the back paint, but this was balanced by its rarity, which helped drive its price up to $59,750, more than triple high estimate. The shorebirds that brought the highest bids were, of course, the Holmes black-bellied plover and the Crowell ruddy turnstone (covered above), but there were ten others that made the top 25 list. Russ Aitken had five by Thomas Gelston of Quogue on Long Island, New York; two sold way over estimate at $35,850 (curlew) and $15,535 (running greater yellowlegs). He had four by Obediah Verity of Seaford on Long Island, New York of which two made the list: feeding knot at $35,850 and black-bellied plover at $16,730, both over estimate. His one black-bellied plover by John Dilley of Quogue was over estimate at $28,680 and his one black-bellied plover by William Bowman of Maine and New York was over estimate at $20,315. The other two were the Holmes feeding yellowlegs and the Crowell preening yellowlegs decorative, both previously mentioned. An excellent gadwall hen, hollow-carved by John Blair Sr. of Philadelphia sold well over estimate at $35,850, placing it in a four-way tie for 9th place. A fine mallard hen, carved by Joel Barber of Wilton, Connecticut and painted by Dr. Edgar Burke of Ocracoke, North Carolina made $10,158, more than double high estimate. A yellowlegs by George Boyd of Seabrook, New Hampshire did not have the usual crack in its slender neck and only a few tiny dents, which was enough to push its price up to $10,158, more than double high estimate. The high point of the Aitken miniature collection was the two Carolina parakeets by A.J. King of North Scituate, Rhode Island, complete with a protective bell jar, which brought $11,950, about triple high estimate and an auction record price for this maker. We know many collectors who started out collecting contemporary carvings and then cleared them out to make room for historically important decoys, not many like Russ Aitken who collected both from the beginning. The few who saw his collection admitted they saw a few good birds but tended to downgrade the collection, because of the contemporaries, as “uneven.” From what I saw in the catalogue, it seemed to me that he was primarily interested in form, and it made no difference whether it was an old working decoy or a brand new contemporary; if it had form, he wanted it. How else to explain the nine by McNair (selling at prices from $1195 to $3585), the 12 by Gibian ($478 to $1912), 14 by Kerr ($359 to $2629) and 15 by Bob White ($717 to $2868)? The top 25 lots brought $1,939,290, over twice as much as the total of the other 340 lots in the auction, which add up to $894,278. And there were no buy-ins - everything sold. Simply stated, 365 lots sold for $2,833,568 for an incredible average of $7763 per lot. The gross was higher that the $2,708,825 gross of the Hillman auction in 1996, but the average falls short of the McCleery auction’s $19,214 per lot (2000). Ward Bros. (MD) pair ringnecks, dec.
A.E. Crowell (MA) preening yellowlegs, dec.
Price includes buyer’s premium, which is 19½% of the hammer price up to and including $100,000, plus 10% of any amount in excess of $100,000. This premium was also factored into the average estimates above. The Top 25 Lots (7% of the 365 sold) accounted for $1,939,290 (68% of the $2,833,568 gross) and was 44% over the total average estimate of the top 25.